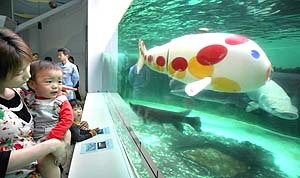 The robotic koi carp unveiled last month by a group of Hiroshima engineering companies (led by Ryomei Engineering) is scheduled to make its first public appearance this weekend. It was spotted during rehearsal in a large tank at Miyajima Aquarium (in Hatsukaichi city in Hiroshima prefecture), practicing its trademark moves of spinning around, treading water, and swimming in reverse. The robot appeared to be getting along will with the other fish in the tank -- an alligator gar and three endangered pirarucu that measure over 2 meters in length. �It looks like a robot, but it behaves like a real fish,� said one surprised onlooker. Public demonstrations of the robot will be held at the aquarium this weekend (April 15 - 16). That's really cool that it's actually going to be able to be seen by the public. I want to go. What they should do is make like mini versions of them and sell them as a toy but of course it won't be as high tech as the original.